Nevada Trails is a planned community developed by Pardee Homes in Southwest Las Vegas. The community is conveniently located to everything in town including the Las Vegas Strip. Many residence that live in this gorgeous community, with huge palm tree lined streets, commute to the Las Vegas Strip often for work or pleasure. Nevada Trails is surrounded by great shopping, restaurants, gyms, 16 acres of parks, and schools. Homes in this community range from 1,400 – 5,000 sq ft with the average being about 2,750 sq ft. Homes in this desirable community are moderately priced to fit many budgets. There are traditional non gated neighborhoods and also more private gated neighborhoods. 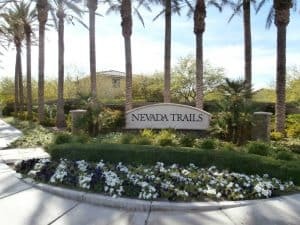 This Las Vegas community also offers excellent perks to enjoy an active lifestyle for all ages including walking trails, biking trails, picnics, or even hiking nearby.